Your website visitor just submitted a form on your website. Now what? If you’re a marketer, you know that it’s important to send the visitor to a page to help set their expectations and to give them more information. This page is typically called a “Thank You” page and is where a visitor should be redirected after they submit a form on your website. Most form building tools allow a visitor to be redirected and you may need the help of a webmaster to get the page setup and the form configured properly. Once your thank you page is set up, its time to take it to the next level with conversion tracking. A conversion on is a measurable milestone that a visitor takes on your website or other digital platforms. This milestone could be a single step, multiple steps, and in some cases doesn’t even need to become a lead. You may, for example, a conversion may simply be that the user viewed 5 pages on your website. In this scenario, we’re looking at conversions that happen when a site visitor becomes a lead by using a Thank You page. A thank you page is where the visitor is sent to after completing a milestone. Often this is by purchasing a product, subscribing to a newsletter, or filling out a form. When a user completes the milestone they are sent to a thank you page with information that sets their expectations in the right direction. 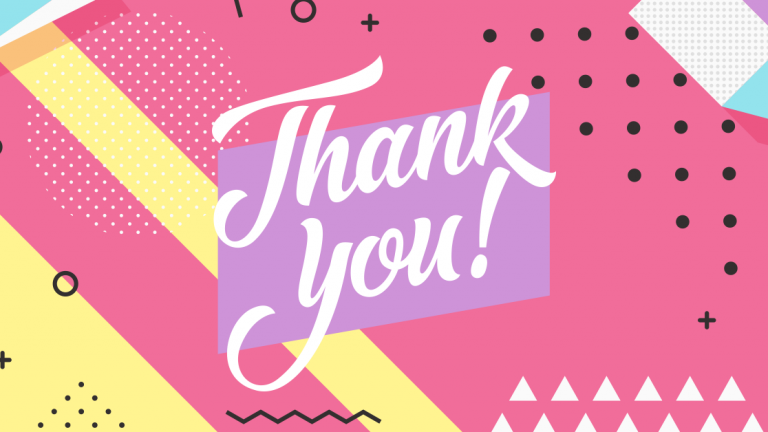 For example, an e-commerce thank you page will include a copy of the order, details about shipping, and how to contact customer service if you have an issue. After filling out a contact form a user might be sent to a thank you page with additional resources that might help answer their question quicker and will help continue the visitors’ engagement with other content on your site. For example, our thank you page includes additional marketing resources that the visitor can download. This page should always be helpful and should aim to keep visitors engaged. How do I track conversions using a thank you page? Typically we use analytics software to help us gain insight into how a visitor engaged with our website. While it’s possible in many analytics software we’ll use Google Analytics as a point of reference. In this case, we want to track a conversion any time someone visits the thank you page. We also want to ensure that we only track visitors who filled out the form first. Suppose we have a contact page that resides at /contact/ and a thank you page at /contact/thank-you/. In this scenario, we only want to track conversions for those who visited the contact page first. In analytics, we can do this by going to our website property then selecting Admin. Here you will see a button called goals under the view column. 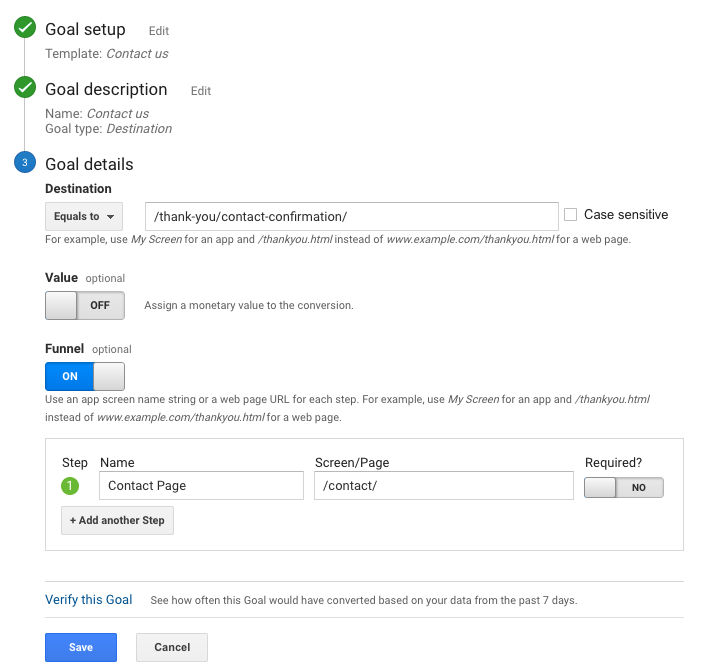 In analytics, a conversion is defined by the completion of a goal. As you can see in the below photo, we’ve created a destination based goal using the thank you page URL and added funnel step to only track visitors who viewed the contact page first. Why is tracking conversions important? If you’re spending money or time on digital marketing you should be tracking conversions. This will help you determine which marketing activities generate the best ROI (return on investment) and will alert you to issues in your marketing activities. For example, if conversions are down, you’ll be able to see where they are down and why much easier with conversion tracking. This also gives you the data necessary to prove the value of digital marketing to other decision makers. If you’re like most, you might need help getting your conversion tracking put into place and the consulting of a digital marketing agency to help you get started. Give the Colorado Marketing Agency with the best customer service a call or message today! Download the guide to turning your digital marketing campaign around. Find out why email marketing is still the highest converting medium.